Have you ever noticed that in a slight change in the shape of our eyebrows can bring drastic change in the appearance. Well, yes !!!. Shape of our eyebrows plays an important role. Here is the diagram that can help you how to get the perfect arch for your eyebrows. Perfectly arched eyebrows can make your eyes look even more beautiful. Earlier I was not aware that such tricks even exist but for the past couple of years I have been shaping my eyebrows myself and that suits my facial features as well. A is the beginning point of the brows, determined by the straight line upwards from the sides of the nose, where the eyebrows should start and all the hairs before that point should be tweezed away. If in case the nose is wide than the beginning point should not follow this point otherwise that might look awkward and the beginning point should be determined as per the distance between the eyes. My nose is broad so I take the line from the Front part of my nose instead of the nostrils. B is the point of the highest arch or the point of the eyebrows, however it should not be way too high or else it might end up looking like as if you have a surprised or shocked facial expressions. 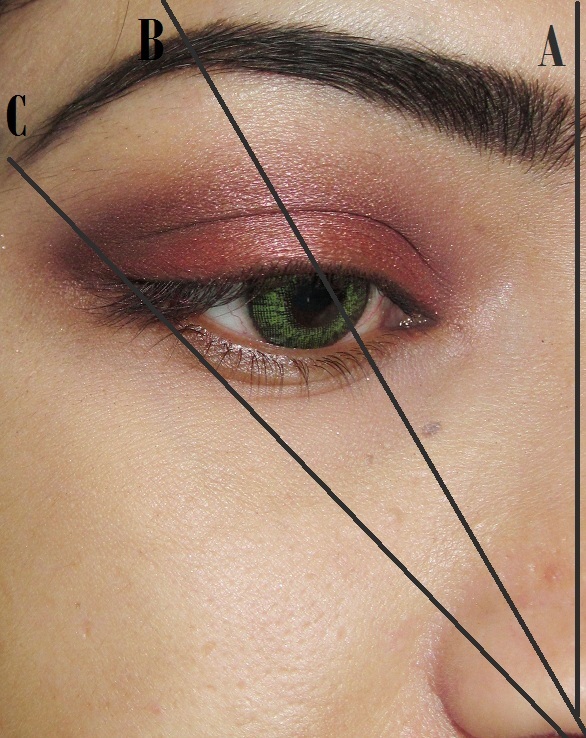 C is the point where the eyebrows should ideally end, which is a slant line that goes straight upwards from the sides of the nose and the corners of the eyes. if you have a shorter eyebrows then a bit of filling in can do the trick. and please do not over tweeze, stick to the natural shape by only changing it a bit and your eyebrows can do wonders for your face. Great article and you have explained it so simply. When in school, I had found in my grandfather's collection a great guide to beauty, cooking, gardening, automobiles etc. The beauty section had this technique explained with holding a pencil, point facing upwards to the side of the nose and then moving it towards the end of the eyes to get your natural arch. Have tried tweezing a few yrs ago but couldn't get as perfect as you. Do you also cut the extra hair length like they do when threading?